Datsun the fully owned subsidiary of Japanese car maker Nissan Motors has launched its second product Go+ MPV in Indian car market with starting price of Rs. 3.79 lakh (ex-showroom price, New Delhi). The MPV is already on sale in Indonesia and was showcased during the Indian Auto Expo 2014 along with Go hatchback. The MPV has been launched with single engine option of 3 cylinder 1.2 litre petrol engine as offered in Go hatchback. The engine churns the power of 67 bhp and torque of 104 NM. Under the hood it is offered with five speed manual gearbox system. Go+ has been offered in four trims namely D, D1, A and T which is the top end variant and bestows features like power steering, air conditioner, front power windows, and supports connectivity with USB and AUX-In. 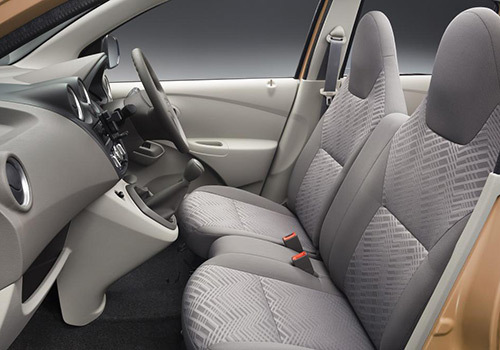 Apart from these features the top end variant also offers the option of driver seat airbag. The ex-showroom price of different trims is priced as Datsun Go+ D-Rs 3.79 lakh, Datsun Go+ D1- Rs 3.82 lakh, Datsun Go+ A- Rs 4.15 lakh and Datsun Go+ T- Rs 4.61 lakh. Physically Go+ has the length of 3.99 meters with wheelbase of 2.45 meters. At first instance the MPV looks like the enlarged version of Go hatchback. The car maker had already started the booking of MPV on the down payment of Rs.11,000 which is refundable to the owner on cancellation of booking if he is not interested to buy it.